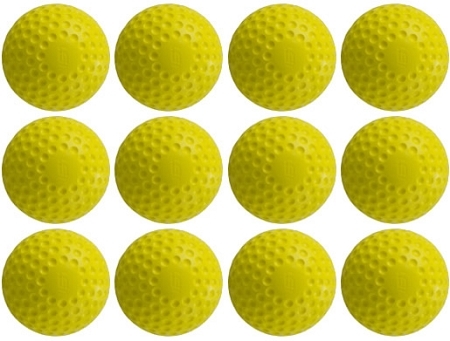 This 12-pack of dimpled pitching machine softballs is made specifically for use with First Pitch pitching machines. Made of super durable polyurethane, they last practically forever! 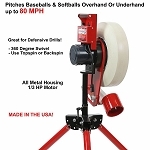 Available in 11-inch or 12-inch sizes, these dimpled pitching machine softballs not only are made to withstand the pressure from pitching machines; but, because they do not have seams, they pitch far more accurately than leather softballs do. They also do not wear out a pitching machine's wheels as much as the seams from a real softball do either. 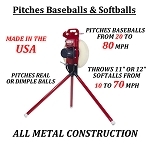 If you are buying a dozen First Pitch dimpled softballs along with a First Pitch pitching machine, please add them via the check box on the pitching machine's page. 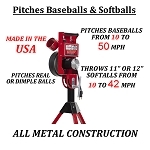 They are $5.00 cheaper when added on the pitching machine's page! 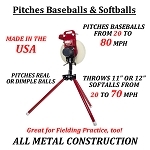 First Pitch dimpled pitching machines balls should work well with most pitching machines. 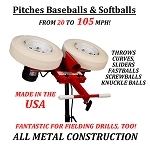 They are specifically approved for use with the following First Pitch machines. No matter where you order First Pitch Dimpled Softballs from, NOBODY actually stocks them; they all ship directly from the manufacturer's warehouse located in Maple Plain, Minnesota. Therefore, the shipping time frame is exactly the same no matter what website you order from (we hope that it is this one!). 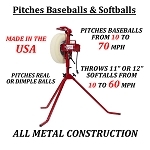 First Pitch Pitching Machine Softballs typically take 2-4 business days to ship from the time you place your order. They ship via United Parcel Service (UPS) and could take anywhere from a day or two to a week to get to you AFTER being shipped, depending on your proximity to their warehouse. We will notify you of your tracking number the moment we receive it from the manufacturer's warehouse.